What is TCP/IP ? | Learn More Now ! Pay2Amigos Read More Now! TCP/IP – (Transmission Control Protocol/Internet Protocol). In the Internet’s early days, the U.S. military developed these two protocols to allow computers to communicate over long distance networks. IP refers to the moving of data packets between nodes. TCP has to do with the verifying packet delivery. TCP/IP is often described as the foundation of the Internet. Because it is an integral part of Internet access, TCP/IP is built into all major operating systems like UNIX, Windows, and Mac OS. TCP is a connection-oriented protocol, which means a connection is established and maintained until the application programs at each end have finished exchanging messages. It determines how to break application data into packets that networks can deliver, sends packets to and accepts packets from the network layer, manages flow control, and—because it is meant to provide error-free data transmission—handles retransmission of dropped or garbled packets as well as acknowledgement of all packets that arrive. 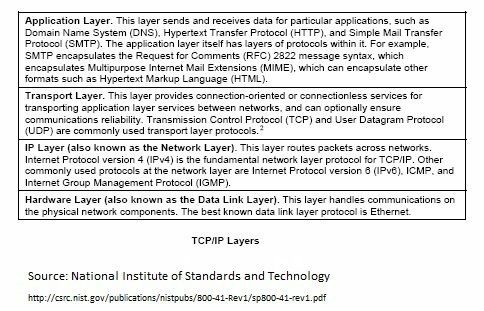 In the Open Systems Interconnection(OSI) communication model, TCP covers parts of Layer 4, the Transport Layer, and parts of Layer 5, the Session Layer.